After 71 years, legendary comedian Bob Newhart is finally getting to see the Chicago Cubs play another World Series. The last time was 1945, when he was 16 and cheering from the streets surrounding Wrigley Field. Today, Newhart is 87 and still keeping the faith. 71 wearisome years. That's how long Bob Newhart has waited for his beloved Chicago Cubs to make it back to the World Series. And this year, they may finally get their championship rings. The Cubs last made it to the World Series in 1945, when Newhart was just 16-years-old. He was part of the crowd at their National League pennant victory parade that year, something Newhart still fondly remembers. 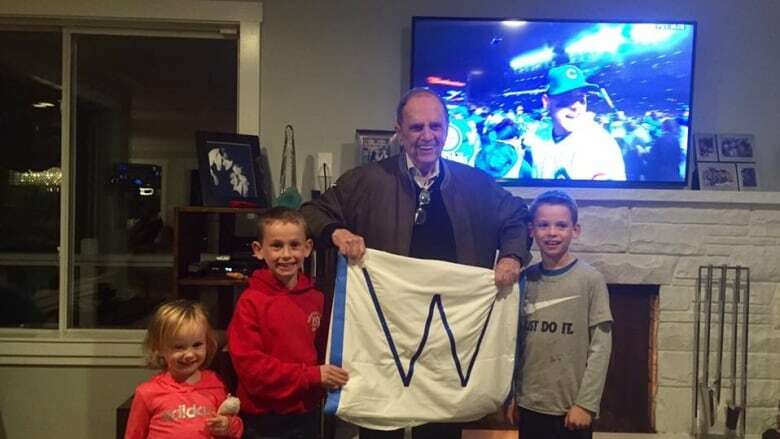 Newhart has become a social media hit this season after posting photos of himself waving Chicago's 'W' flag, which is flown over Wrigley Field every time the Cubs win. As he tells Day 6 host Brent Bambury, part of being a Cubs fan is having a lot of faith. I said look, I'm 87-years-old, I can't survive this. You've got to score more runs. I can't go through this with you anymore. "If there's one statement that's true about the Cubs, it's that hope springs eternal," Newhart says. The actor and comedian jokes that being a Cubs fan prepares you for life. "You never got your hopes up because you knew when you were winning, but somehow you were going to blow it," jokes Newhart. "It's a great way to face life." Newhart starting going to Cubs games in the 1930s, when he went to the games with his mother. "My Dad worked during the day … the Cubs didn't have lights for years and years and years, so all they had were day games. And my mother was a Cub fan, my Dad was a White Sox fan. Maybe those were the early signs of rebellion," he laughs. Newhart says he didn't like the White Sox -- the other Chicago baseball team -- because he thought they were boring, but he thought that the Cubs were exciting. "My wife and I went to a game and the Cubs were behind three runs, so we figured, let's beat the crowd and so we started to leave. And we were walking down Addison [Avenue] in Chicago, outside the stadium, and we hear this roar. And I asked somebody, I said 'what happened?' They said the pitcher just hit a homerun with the bases loaded. So that's why I'm a Cub fan. You just never know," jokes Newhart. In 1945, Newhart attended the Cubs' victory parade after the team won the National League pennant. The parade took place just as the Second World War was ending. "All the able-bodied men were off to war, which is probably the reason the Cubs won the National League pennant that year," he laughs. "You know, people don't believe it, but they had a one-armed outfielder named Pete Gray, and they'd hit the ball to him and he'd catch it in his glove, and then he'd throw the ball up in the air and take his glove off and catch the ball and throw it in." How long will Newhart have to wait? Newhart's wife, Ginnie, reminds him that it's only a game, but he admits that watching the Cubs can be stressful. He tells the story behind a recent Facebook post, which came after the Cubs' posted a late-game comeback win against the Los Angeles Dodgers in the division playoffs. "They were behind 5-2. And then it's was the top of the ninth and the Cubs scored four, so now it's 6-5 [for Chicago]," explains Newhart. "I said look, I'm 87-years-old, I can't survive this. You've got to score more runs. I can't go through this with you anymore." Newhart is currently on tour with his stand-up comedy show and says he may have to watch part of the World Series on the road. "I have two dates. I took the dates feeling pretty sure that the Cubs weren't going to wind up in the playoffs, that they were going to blow it somehow," laughs Newhart. He says that he started doing stand-up 56 years ago, and that it's his first love. Newhart says that as long as he's physically able, he'll continue to perform. "People say, 'why don't you retire?' And I say, well, how can you say to people 'you know, I'm really tired of making people laugh. I don't think I want to do that anymore," he says with a laugh. The Cubs face Cleveland in Game Four of the World Series in Chicago, Saturday at 8pm ET. Can the Chicago Cubs finally break the 71-year-old billy goat curse? Can you actually grow grass inside the Rogers Centre?